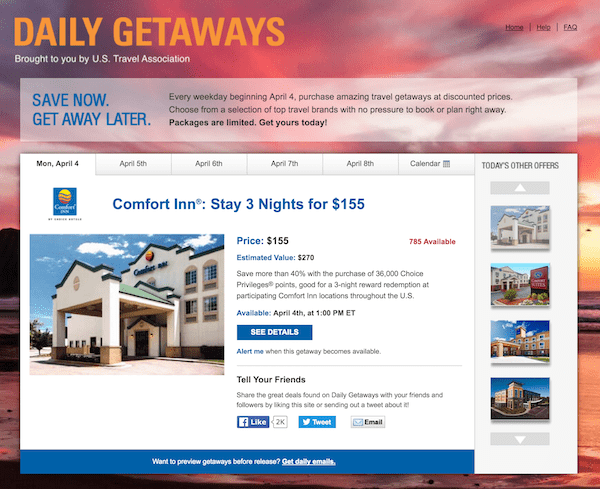 The US Travel Association is once again running its Daily Getaways promotion. Beginning April 4 there will be a different offer for a limited time each day. As was the case last year, there is no added discount for using an Amex card as there has been in previous years. You can find discounts on rental cars, hotels, and theme parks. In this post I calculate the Daily Getaways 2016 valuation for the hotel offers. Likely the most popular offers will be for the hotel stays that, for the most part, come in the form of loyalty points. Below I have created a grid that shows the cost per point for each of the hotel point offers. Remember: Not all points are created equal. A Hyatt Gold Passport point is worth three times what a Club Carlson point is. For the “valuation” column, I am borrowing the most recent data from The Points Guy, he tends to do a good job of valuing points. The promo for Hilton costs 0.5 cents per point, which is equal to their value. Therefore, I would not suggest purchasing Hilton points as they are not really on sale. Hyatt appears to be the biggest discount (based on what you pay vs what they are worth). For most of the hotels, you get the cheapest points by buying in bulk (i.e. purchasing the largest offer). However, Hyatt is the one exception — the best value is the 40k (second largest) offer. I do not have a valuation for Best Western points. All of the prices are the same as last year’s 2015 Daily Getaways. Note that all the deals are limited, some VERY limited. So if you want to get one of the packages, make sure you are logged on and ready to go when the deal goes live. Some of the Vegas deals (M Life, Caesers, Venetian) might offer value if you are able to use them at an otherwise expensive time. 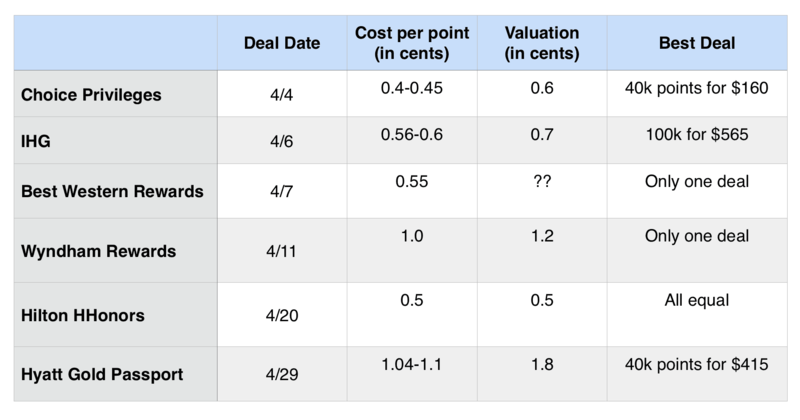 What deal interests you the most?